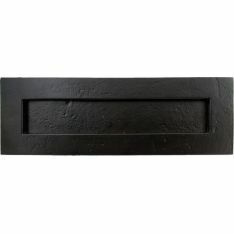 From the Anvil letterplates come in a variety of styles and finishes, in order to suit both traditional and contemporary entrance doors. Most letter plates are handmade from steel, but there are several solid brass letterplates as well. We also stock more ornamental letterplates, including the polished brass postal letter plate, and some letterplates which can also cut down on draughts, such as the pewter blacksmith traditional letterbox. We also have available letter tidies to cover letter plates and escutcheons to cover keyholes, giving an overall neater and tidy appearance to your doors. Some of our letterplates also have a door knocker incorporated, however, if you require a separate door knocker, we have a wide range of them to choose from. Door knockers are ideal for visitors to alert you of their presence and they can also be an ornamental piece on your door. Door letters and numerals can also add a bit of style to any door. In case your entrance door doesn’t have a door handle or centre door knob, we have a selection of cylinder door pulls ideal to help close the door from the outside. Thumb turn locks can also help close the door, but this time from the inside – this type of lock also works a secondary locking method for exterior doors or primary locking mechanism for bathrooms or bedrooms. Door chains and door viewers are also ideal to add extra security and privacy to front doors.